What is the FEZ Panda II? "The 72Mhz FEZ Panda II runs .NET Micro Framework, allowing users to program and debug FEZ Panda using Microsoft's free Visual C# Express. 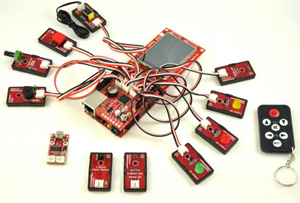 Applications are loaded over USB cable (or serial) with full featured debugging capabilities, such as stepping in code or inspecting variables. FEZ Panda II is an enhanced version of FEZ Panda (the original) with On-board microSD socket, Real Time Clock, and an easily accessible 40-pin female header that exposes the extra IOs"
I got myself the FEZ Ultimate kit. 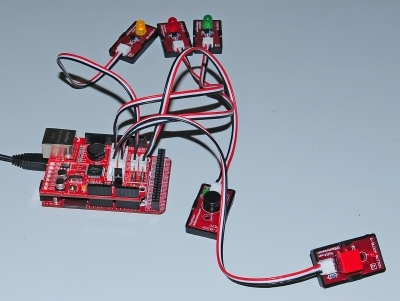 This is the FEZ Panda II with additional modules you can connect to it. As expected it took me some time to get the kit working. The box from GHI Electronics came without any manuals or software, so you have to find it yourself on their website. Luckily it doesn't take too long to find the information I needed. View my summary. I have already created a little test application: a traffic light where someone has to press the button each time the light should change (Lets assume timers haven't been invented yet). Now I have figured out the basics, I can start making more complex programs. Remote buzzer: an application where you can control the frequency of a buzzer over an ethernet connection. K8000 libraries: I figured out how you can connect a Velleman K8000 to the FEZ. Doing so you can extend the I/O possibilities of your FEZ board. Batterie voltage tester: i designed my own hardware to connect to the FEZ board. It is capable to test batteries over a period of 8 hours. It test both loaded and unloaded voltages. Wireless Wi-Fi K8000 / K8000 TCP/IP Server: This is a very interesting project to control the K8000 over a wireless Wi-Fi connection. The FEZ Panda II is used as a bride between K8000 and ethernet network. The projects comes with a sample server & client project.